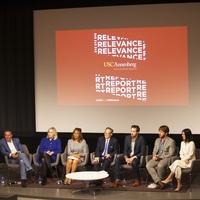 Join USC Center for Public Relations director Fred Cook and PR leaders from top agencies and corporate communication departments to introduce the 2019 edition of the Relevance Report, a collection of forward-looking essays from professionals and academics that predict future PR industry trends in media, technology and society. This annual event will feature board members from the Center for PR and Annenberg students discussing their contributions to the annual report and commenting on current issues facing the PR industry. A reception in the ANN Forum prior to event will begin at 5:00.